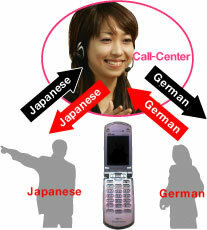 From 7 languages of English・Chinese・Korean・German・French・Spanish・Russian to Japanese, and Japanese to 7 languages. "EZ-Say" is Japan's first interpretation service which supports international talks, available in 7 languages. We rental Interpretation Mobile Phones to visitors from overseas for free.Speed dialing to the Interpretation Call Center allows you to receive Japan's first international conversation supporting system of interpretation service available in 7 languages. Communication service has been available for getting close with guests from overseas. It is awkward that troubles occur in information and service businesses, or even in business negotiations in front of your guests from overseas just because you do not understand the language. There are many occasions when you wish you were able to make conversations in another language. Since the number of visitors from overseas tend to increase now,those problems can happen to us. However, for firms and various service businesses, it must be a reality that they are too busy to hire and develop human resources who can fluently speak daily conversations in a foreign language to solve these problems. Furthermore, you can say it is almost impossible to hire and develop human resources who can speak 5 or more languages. 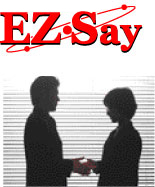 "EZ-Say"is a measure to solve those problems as mentioned above. And werecommend you "EZ-Say" as a way not only to facilitate your work but to differentiate your services from other companies. Results in using remote interpretation :Bank・Electronics Retail Store・Travel company・Trading company・Commercial firm・TV Station・Government etc. ※Please be reminded that corporate names can not be announced officially.